Full Effect Gaming: A Return of Nintendo Sports! A Return of Nintendo Sports! ... Nintendo used to be somewhat self sufficient when it came to genres that were lacking on their consoles due to major 3rd parties showing it "no love." Back when EA first took a look at the Nintendo 64, they didn't entirely liked what they saw. High licensing fees, expensive cartridges for their games that required a set number order, were just a couple of things that scared EA when it came to the Nintendo 64. 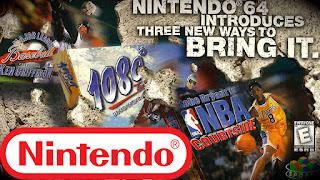 So when it looked like there would be no support from the biggest sports video game producer, Nintendo formed a part of what they once called the Dream Team (N64 was codenamed Project Dream), to fill the void in sports games that EA had left on their console. The Nintendo backed studio Left Field created some amazing sports titles for the N64 including Kobe Bryant Courtside, Ken Griffey Jr Baseball, and the classic Waverace 64. So come take a walk with me down memory lane where I explore these titles and ask the question: "Should Nintendo create a new studio to make their own in house sports titles that don't entail over the top versions of simulation sports games with Nintendo characters in it?" Let's figure it out! Click below and enjoy this episode of Throwback Tee!